After this year's Midwest Haunters Convention, I came home inspired and ready to go. I had a few different projects going, and I was ready to finish them all up and then start on the next round. Except it never happened. The past two months off really helped my creativity. I refocused on other, non-Halloween things and I was able to clean out the cobwebs from the October side of the brain. And I'm glad I did. Last week, I realized that we were getting close to the 100 day countdown to the big night, and with renewed spirit I restarted the creativity machine. First up, some new blog art. Nothing gets me going quite like working on new design work, so I decided to update the blog masthead banner. As soon as I started, the ideas and creativity exploded. After the new banner, I cranked out the new "100 Days" image above. Boom! The countdown is on!! After that, I went to work on some of the framework of the blog. If you'll notice the "Pages" section to the right, I added two new (and much-needed) pages. The first, and most important, is the new "Highbury Halloween Prop How-Tos" page. Every Halloween prop how-to I have ever done is now conveniently cataloged into one page. And I even whipped up a small banner for this page, too. The second is the new "Cemetery Photography" page. All of my Cemetery Sundays visits through local cemeteries are now cataloged in one place. Tons of cemetery photos that can be used for reference when creating tombstone props or just to look at if you enjoy the beauty and detail of old tombstones. 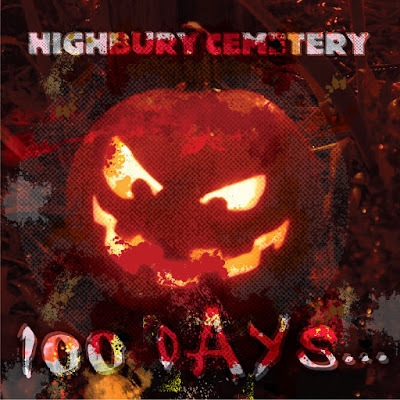 I also still have the "Highbury's Halloween Punkcast Series" page, where you can download all of my horror-themed punk rock mixes for free. Nothing like these tracks to fuel you through a late-night prop-building session! And I have at least one or two more pages that I will be adding as the days go on, but I'm going to shift back to all of those unfinished props for now. I have a few new posts ready to go, so I should be adding new posts more frequently. The switch has been thrown and the creative juices are again flowing. It feels great to be back and ready to knock out a new season of Halloween goodness. Only 100 days to go!! 100 days will be gone on a blink! New pages look great. Might have to copy your Obelisk design! We keep wanting to build one but seen some look really good and some look not so good. You have some good details on yours. Thank you, Mark! In looking at the obelisk now, it seems like I could add some more detail work! Funerary Call - "The Mirror Reversed - Part 1"